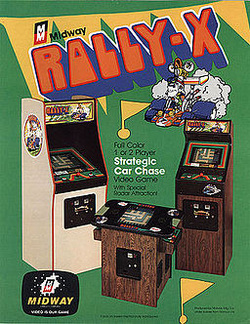 Rally-X is a maze & driving arcade game, that was released by Namco in 1980 and licensed to Midway Games for US manufacture and distribution. It runs on Namco Pac-Man hardware, and was the first game from the company to feature "Special Flags", which would become a recurring object in later games (along with the Galaxian flagship and their signature character Pac-Man; the latter also made his arcade debut in 1980). In the game, the player must direct a blue car around a maze which is supposed to resemble city streets. The car will automatically move in whichever direction the joystick is pushed, but if it runs into a wall, it will turn and continue. In every round, ten flags are scattered around the maze. The player must collect all of them to clear the round and move on to the next round. The flags increase in value as they are collected: the first is 100 points, the second is 200, the third is 300, and so on. There are also special flags (indicated by the letter "S") — if the player collects one of them, the value earned from flags doubles for the rest of the round. If the player dies, however, the next flag value is set back to 100 and the double bonus is lost. By collecting the special as the first flag with all 10 flags in one run, the maximum points the player can obtain from each round is 11000. The player will also obtain a fuel bonus after the round is complete, and it varies depending on how much fuel is remaining according to the fuel gauge. The car has a limited amount of fuel which is consumed with time, though it is normally sufficient to last until all ten flags have been collected. When fuel runs out, the car moves very slowly and the smokescreen no longer works, so it very quickly falls victim to the red cars. If the player should clear any round without any fuel remaining (a rare occurrence), he will not receive a fuel bonus as a result. There are also stationary rocks that the player must avoid. The rocks are randomly distributed throughout the maze, increasing in number as the game progresses. Unlike the cars and flags, their positions are not shown on the radar, so the player has to be careful for them. On the third stage and every fourth stage after that, a bonus stage ("CHALLENGING STAGE") will start. The player must collect flags in the normal way, but the red cars (the maximum normal number of red cars, which is eight), are unable to move. If the player runs out of fuel, the red cars will start moving. If a player hits a red car or a rock, the challenging stage ends, and the player loses a life. Once the player has run out of lives, the game will be over; if he or she had the highest score of the day, the game will tell them so.